French warned terror "threat is still present"
PARIS -- French security forces were mobilizing in their search for what the prime minister called a "probable accomplice" to three days of bloodshed and terror around the capital, as well as to try to ensure the safety of the French people. Prime Minister Manuel Valls said the search was urgent because "the threat is still present" after the attacks that left 17 people dead -- journalists at the satirical newspaper Charlie Hebdo, hostages at a kosher market and three police officers -- plus the three attackers, who were killed Friday in nearly simultaneous raids by security forces. Meanwhile, France's defense minister said the country is mobilizing the 10,000 troops to protect its people. Minister Jean-Yves Le Drian said the deployment will be fully in place by Tuesday and will focus on the most sensitive locations. By midday Monday, Paris' Marais - one of the country's oldest Jewish neighborhoods as well as a major tourist site - was filled with police and soldiers. The move comes a day after nearly 4 million people rallied in France in a show of support for the victims of the attacks. 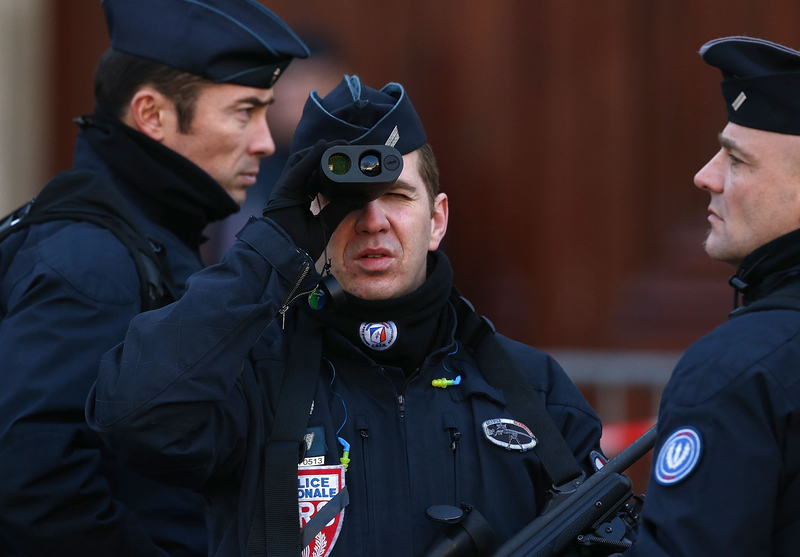 Officials said the gatherings staged across France were unusually incident-free. The widow of one of the attackers crossed into Syria on Thursday, the day after the Charlie Hebdo massacre, and the same day her common-law husband shot a policewoman to death on the outskirts of Paris, according to Turkey's foreign minister. Video emerged on Sunday of her husband Amedy Coulibaly, explaining how the attacks would unfold and police want to find the person who edited and posted the video, which was done after the attacks were over. In the video, Coulibaly pledges allegiance to the Islamic State of Iraq and Syria (ISIS). It remained unclear, however, how close his ties to the group actually were, and what role, if any, ISIS had in his attack. CBS News' Holly Williams reports that intelligence officials believe Boumedienne may have crucial information about whether her boyfriend and the other two attackers in Paris were part of a bigger terrorist cell in the French capital. Boumedienne spent five days in Turkey before crossing into Syria, and as Williams reports, if she's gone there to join ISIS or another extremist group, she won't have been the first European woman to do so. Hundreds of young Muslim women and girls from Europe have traveled to the war-torn country to join ISIS and al Qaeda. Turkish Prime Minister Ahmet Davutoglu insisted later Monday that his government was not to blame for allowing Boumedienne to pass through the country into Syria, saying without prior warning from European counterparts, Turkey's border services do not block individuals from entering. Survivors say the Charlie Hebdo attackers, brothers from Paris, claimed they were from al Qaeda in Yemen, or al Qaeda in the Arabian Peninsula (AQAP), the group the U.S. considers the most dangerous offshoot of that network. Ties between Coulibaly and Said and Cherif Kouachi, the brothers behind the attack on Charlie Hebdo's office, date back to at least 2005.